Growing up with animals and the loving bond a human has with a living creature (big or small), is where the inspirations and determination to become a Veterinarian began. As a child, Dr Kayla Jones’s family owned numerous species of animals from dogs, cats, birds, fish, chicken, horses, guinea pigs and even rabbits (was born and raised in Western Australia). 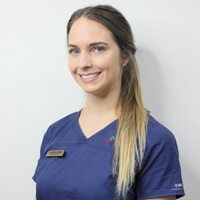 Kayla came to Townsville to start her Bachelor of Veterinary Science at James Cook University in 2007. After graduation she worked several years in general practice, It wasn’t until starting emergency work at a University veterinary teaching hospital that she really found her passion for Emergency Medicine and Critical Care for Small Animals. After doing a placement at the Animal Emergency Service in her final year of University, Dr Kayla Jones always had her heart set to work for the best! So it didn’t take a seconds hesitation to accept the position in 2016 with the Animal Emergency Service. At AES we pride ourselves on continuing education and improving our knowledge and skill set to provide high-quality medical care for all family pets. Dr Kayla Jones has completed and became a member of the Australian Veterinary College in 2017 in the Emergency and Critical Care chapter for Small Animals, which also rewarded her with her role as one of the senior Veterinarians within the team. Kayla loves working for AES as its one huge supportive family, and every person loves and cares for what they do and the difference they can help with families and their precious pets.